Creating personalized art is a fun way to put meaningful initials, words, and phrases on display in your home. Plus, it allows you to upgrade your plain vertical spaces on a budget. 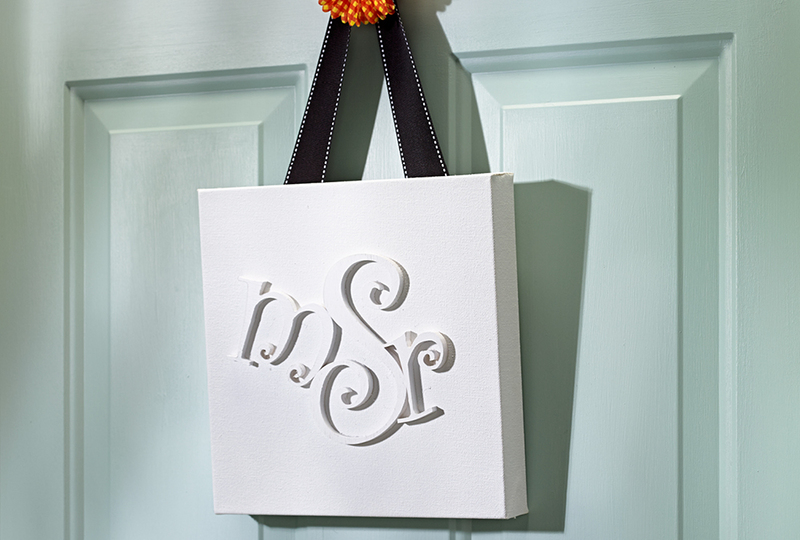 This art project turns an inexpensive blank canvas, some three-dimensional letters, and paint into a stylish accent. All of the supplies for the project are available at craft stores and home centers. The first step is to choose the letters you want to display and a canvas that accommodates them. Then just follow a few easy steps, and you'll have a fun piece of art in no time! First, apply all-purpose construction adhesive to the letters, and press them in place on the canvas (photo 1). Use a straightedge to position the letters in a straight line, or arrange them in a whimsical way as we did. When the adhesive is dry, apply thin, even coats of spray paint over the entire canvas and the letters (photo 2). You'll need to spray on a few coats to ensure complete coverage. For a decorative way to hang your art, use a staple gun to secure a piece of ribbon to the back of the canvas (photo 3). The great thing about this project is that you can design it to fit whatever space you're trying to fill. If you have quite a bit of empty space on a wall, you could opt for one large piece of art, or you may want to group a set of smaller canvases together (photo a). A smaller-scale piece of canvas art can add style to a shelf, too (photo b). For these two design options, we chose different styles of letters than we did for the main option, which featured wood letters. You can find an assortment of letters and phrases in the scrapbook department of your local craft supply store, and choose whatever you like. If the surface of your letters is very smooth or shiny, however, just be sure to scuff them up a bit before painting. Lastly, if you're using self-adhesive letters that aren't quite sticky enough, we recommend spraying the backs with a little bit of spray adhesive. This will keep them in place for the long haul.